This volume provides an entirely fresh, comprehensive treatment of the Battle of Qadesh and all the other wars and campaigns of Ramesses II. <b>K. A. Kitchen</b> was formerly Brunner Professor of Egyptology in the University of Liverpool, where he taught for 40 years. 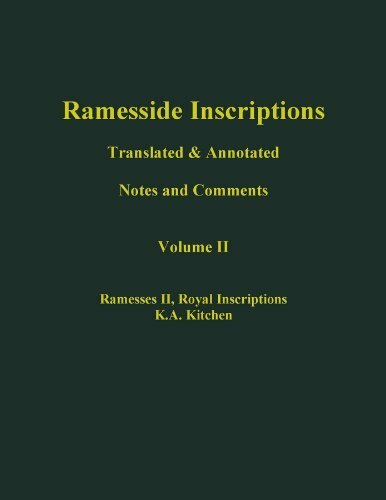 During that time, he worked extensively in Egypt, recording the texts for the hieroglyphic edition of <i>Ramesside Inscriptions, I-VIII</i> (B. H. Blackwell, 1969-1990), that is the basis for the <i>Translations</i> and volumes now being issued. He has also produced a major book on Egyptian chronology for later Egypt (1100-650 BC), a classic popular &quot;Life and Times&quot; of Ramesses II, and a comprehensive Catalogue of the notable Egyptian collection in Rio de Janeiro; other books on archaeology and the Bible; and recently the first of a series in Ancient (pre-Islamic) Arabia, besides innumerable articles and reviews. He has lectured worldwide in these various spheres of enquiry.